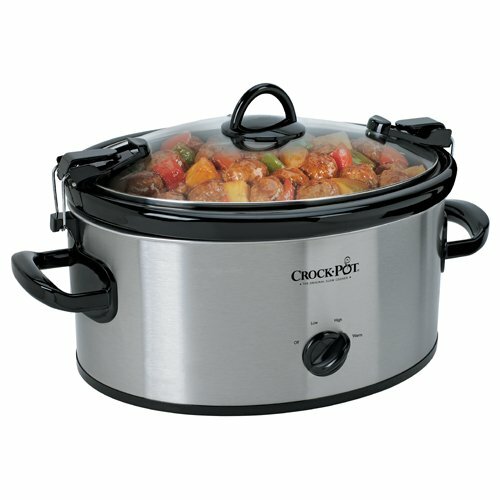 On days busy days where I need to squeeze dinner between work and evening sports activities for my children or my triathlete husband, the slow cooker is my saving grace. Slow cookers make life a little easier because dinner is checked off of my mental “to do” list first thing in the morning. I can still feed my family a home cooked meal before we scoot back out the door for basketball practice, volleyball practice or swim lessons, and nighttime cleanup is a snap. A few of these recipes are meant to cook for eight hours while you’re at work, while others like the poached salmon give you hands-free time for an hour while you take a quick run, help a child with homework our catchup on a few things around the house. Whatever your schedule or daily routine, I hope you’ll find a slow cooker recipe below that suits your needs. Take a little time in the morning to brown the ground beef and onions before adding them to your slow cooker. When you return home from work the only decision you have to make is: sour cream or no sour cream? Poaching salmon doesn’t take all day. You only need five minutes to prepare this dish and then about an hour in the slow cooker. Get dinner ready, then go for a nice long walk or read a book. When you’re rested and relaxed dinner will be ready! Sear the beef before adding it to the slow cooker for extra flavor. Let it cook all day then toss in the egg noodles while you set the table. Slow cookers aren’t just for meat lovers. Vegetables and beans love a good, long soak too. Guinness is one of my favorite beers, which is why I love this stew. If you love Guinness, you’ll love this stew too. Use this spicy chicken to fill tacos, burritos, enchiladas, or quesadillas. Let your imagination be your guide! If you have an army to feed, this pulled pork recipe is for you. It takes a little time so save it for a Sunday supper then eat leftovers all week. Feel free to replace the apple cider in this dish with apple juice and make it anytime you please. For a gluten-free version of this dish, toss the short ribs in a light dusting of gluten-free flour or cornstarch before browning instead of all-purpose flour. Not all slow cooker recipes are meant to stew for eight hours. Layer the ingredients for this Moroccan chicken into your slow cooker, and 2 1/2 hours later, your house will be filled the aroma of cumin, ginger, and coriander. Canned pumpkin isn’t just for pie. Combine it with garlic, carrots, onions, and celery for a savory and healthy soup! Hi, Theresa! The photo at the top of the article is the Slow Cooker Cider Pulled Pork. The link for that recipe is a little more than halfway down the post!